Working in UX, we take empathy for granted. To us, it may feel like an overused buzzword, but we don’t realize that the majority of the business world hasn’t heard “empathy” within the context of a professional organization before. While we start the design phase thinking about customer needs and goals, this process hasn’t been mainstreamed to other practices (and if it has, it’s inadvertently). Attend orientation and training for a job in business development, software engineering, product or project management, or even sales and marketing, and it’s highly unlikely that the word “empathy” will be used at all—it just doesn’t come up. All is not lost! Empathic thinking has started creeping its way into business concept planning and product strategy with empathy maps. 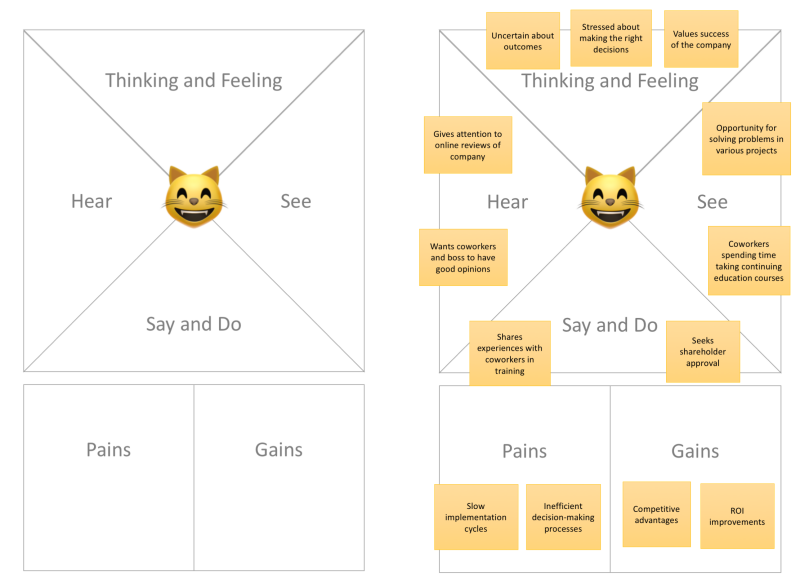 An empathy map is a tool to get to know the target audience (hint: it isn’t you) in order to align the business strategy and value proposition with the customer’s wants, needs, goals, and feelings. Simply, empathy maps get stakeholders thinking about the users they want to serve and not about the product they want to build. What is the customer concerned about or afraid of? Is the customer satisfied? Why or why not? What are the customer’s priorities? What are the customer’s dreams and aspirations? What causes an emotional reaction for the customer? What is the customer hearing? What or who influences the customer? Is your customer easy to influence? Where does the customer get their information? What information channel does your customer use the most? What is the customer seeing? Does your customer spend more time in the public or in private? What does your customer’s environment look like? How does the customer interact with their environment? What is the customer saying and doing? How does the customer portray themselves in front of others? What words does the customer use when talking? What information does the customer withhold or leave out when sharing with others? What is the gap between what they say and how they act? What are the customer’s pains? What obstacles does the customer need to overcome? What frustrations are on the horizon for the customer? Why hasn’t the customer been able to reach their goals? What does the customer gain? What methods does the customer use to achieve success? How is success measured and what does it look like? What are the short and long term goals of the customer? Think about designing a website (layout, content, and all). You start with researching and learning about what the website visitors’ goals are, why they’re on your site (even why they’re here instead of a different website), what’s important to them, and what thoughts and feelings are running through their minds when on your site. Why would laying out a business be different? No matter how polished and thorough your UX work is, none of it will make a difference if the business wasn’t designed with the customer in mind. If we wait until our work shows up in tasks during the design and build phase of a project to voice the importance of user-centricity, we’re waiting too long. How do we get the point across early on? By using empathy maps. It’s one thing to work with a company starting from scratch to recommend putting users first, but it’s a whole different game to convert existing businesses to have a user-first culture. 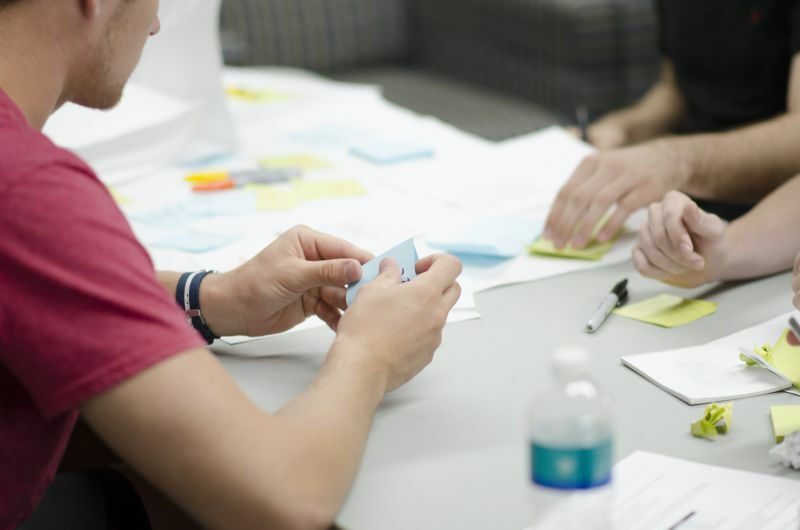 When working with businesses that don’t have an empathy map or early-stage user research process, it can be an intimidating mountain to climb. But getting stakeholders to buy in to empathy maps is a great steering tool to move that way. 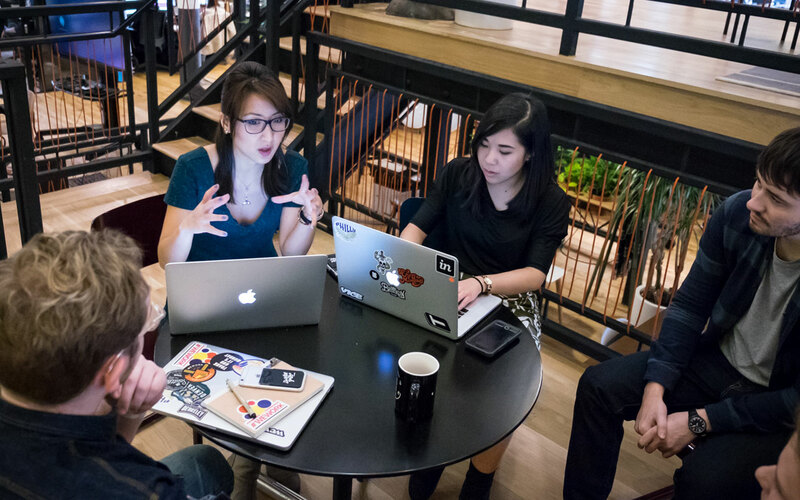 Remember that it’s your job as a UXer to advocate for the user, so even though using customer research in early business decisions may seem out of bounds or like uncharted territory, it’s actually right in line with your job duties. Okay, so I can’t promise an empathy map will result in an immediate spike in the number of active users or get you from zero to $1 million in sales. But I have seen enough businesses flail and blindly make strategic decisions when they could be capitalizing on and delivering value to customers. This post originally appeared on the InVision Blog.